be found with the photos in our three-part photo gallery. The major renovation and expansion work on the museum has finally been completed (see Museum Boom part 1 at The Cheshire Cat Blog), and it was reopened in 2015. The enlarged museum, reputed to be one of Turkey's finest small museums, now has five times as many exhibits as before the renovation, with over 3,000 artifacts never before on display. There is also is a garden with a café for history-overloaded, foot-weary visitors. Atatürk Mahallesi, Uğur Mumcu Sevgi Yolu, Selçuk. The museum is in the centre of Selçuk, across the main Atatürk Caddesi (D550) highway from the Otogar (bus station), about 15 minutes walk from the railway station and 3 km from the Ephesus Archaeological site. and its exhibits in Selçuk photo gallery 2. The museum is open 365 day a year. and admission charges where appropriate. 3 km southwest of the town. 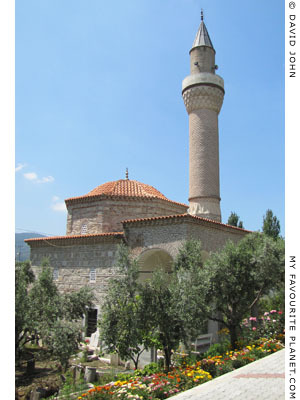 See the My Favourite Planet travel guide to Ephesus. 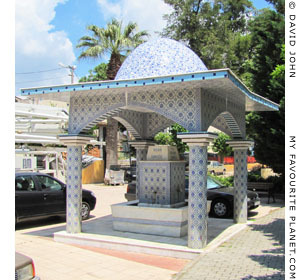 A Roman Catholic and Muslim shrine, on Mount Koressos (Bülbül Daği, Nightingale Mountain), 9 km from Selçuk, 6 km from Ephesus. An ethnographical museum which is part of the Ephesus Archaeological Museum complex. The exhibits include tools, utensils and handicraft objects made and used for personal, domestic, agricultural and commercial purposes in local towns and villages. 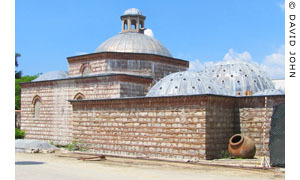 The museum is housed in a 16th century hamam (public baths) which was built, according to an inscription, by Saadet Hatun. Nothing is known about this woman, but she is thought to have been from a local noble family. The building was derelict for many years before it was renovated 1970-1972 by the Ephesus Museum. Along with the Ephesus Museum, this museum is also closed for renovation (see above), and will not reopen before August 2014. The Çamlık Railway Museum (also known as the Çamlık Steam Locomotive Museum; in Turkish Çamlık Tren Müzesi or Çamlık Buharlı Lokomotif Müzesi), in the village of Camlik (around 12 km south of Selçuk), is the largest railway museum in Turkey, run by Atilla Mısırlıoğlu. 33 steam locomotives from Germany, France, Britain and the USA are on display, as well as Ataturk's private railway carriage. There are regular dolmuşes (minibuses, see page 5: getting there) between Selçuk Otogar (bus station) and Çamlık, stopping outside the museum. You can also take a train from Izmir or Selçuk to Çamlık train station, from where the museum is a 1 km walk. Open daily 8:00 and 20:00. Admission 5 TL. Çamlık Buharlı Lokomotif Müzesi, Çamlık Köyu, Selçuk-İzmir, Türkiye. A quaint (touristy) traditional hill village 8 km southeast of Selçuk, with narrow streets, old houses, fruit orchards, home-made wine and lace made by the local women. It has a few pensions and restaurants. Formerly Kirkince, founded by Greeks around 800 years ago. 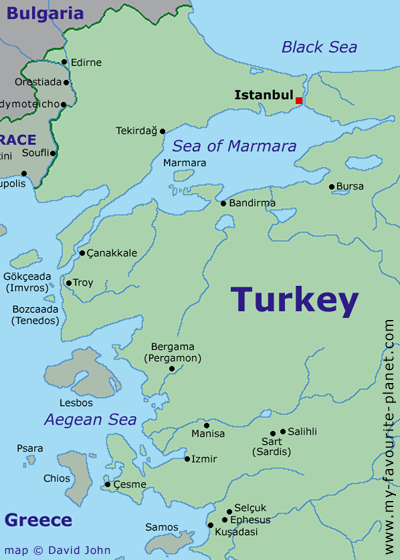 Since the population exchange between Greece and Turkey in 1924 it has been inhabited by Muslims from Thessaloniki. Dolmuşes run between Selçuk and Şirince (8 km) about every 30 minutes in summer, less frequently out of season. See page 5 - getting there and our guide to Kuşadası. The long, sandy beach beach, about 5 km west of Selçuk. Minibuses to Kuşadası will drop you off within walking distance. near the Ephesus Archaeological Museum. now restored as an ethnographical museum. Next to the Ephesus Archaeological Museum. 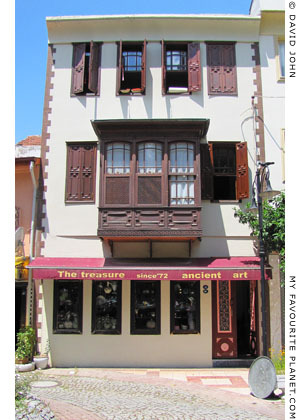 "The Treasure" antique shop, Selçuk. The Belevi Mausoleum is a large Hellenistic tomb, thought to have been built around 301-281 BC as the grave of Lysimachus (circa 360-281 BC), one of Alexander the Great's generals and successors (see our History of Pergamon). However, he was never buried here, since he was killed at the Battle of Corupedium (281 BC) against King Seleucus I Nicator (circa 358 - 281 BC) and his body was taken to Lysimachia in Thrace. It is believed that it eventually became the grave of one of Seleucus' successors, King Antiochus II Theos (ruled 261–246 BC). According to other theories, the Mentor of Rhodos or his brother Memnon or Menandros (another of Alexander's officers) may have been buried here. It is the second largest mausoleum in Anatolia after the similar, and older, Mausoleum of Halicarnassus (built 353-350 BC), after which it may have been modelled. The ruins of the monument are near the modern village of Belevi, in the valley of the Küçük Menderes river (the ancient Kaystros), 14 km northeast of Selçuk, next to the Izmir to Aydin highway. There are said to be regular dolmuşes which will drop you near the site, but so far we have no further details. Although the countryside around the site is beautiful, there is not much to see: just the remains of the mausoleum's base and rows of column parts lying on the ground. For dedicated fans of ancient history and architecture only? Sculptures from the Belevi Mausoleum can be seen in the Ephesus Museum, Selçuk and the Izmir Archaeological Museum. A statue from the Belevi Mausoleum. Outside Selçuk, with stalagmites and stalactites which drip white water into the cave. According to local superstition, mothers who do not have enough milk for their babies drink the water from the cave. Gebekirse Lake (Turkish, Gebekirse Gölü) is a nature reserve, 14 km northwest of Selçuk, 23 km from Kusadasi, near the village of Zeytinköy. It has around 40 species of birds and animals, including pelicans, ducks, woodcocks, wild boar, foxes and jackals. Çatal Lake (Çatal Gölü) is just 2 km east of it. see page 5 - getting there.